Millennials know anxiety, uncertainty, loss and trauma intimately – if you want to reach out to the Millennials, you need to be comfortable to enter into their pain and loss. Millennials build alternative communities – they are masters at it. Join them where they are meeting already. It should NOT be about how we can get them to church. Millennials are spiritual and engage in religious practices like prayer and worship (although they rarely come to church). Millennials embrace accountability – they value integrity. Millennials want to make a difference in the world – they have a cause mentality (or ethic). Millennials need a narrative to live by. We need to help millennials find a (alternative) story to live in/through (and a statement of faith is not a story). Join the millennials – they won’t come back to church. We can contribute – community, narrative and spirituality. But we will have to be willing to move and be teachable. How do we teach young people… we don’t! We need to ask Millennails – what can you teach me? We need to communicate warmth. Mutual learning is needed. We need to cultivate ministry practices that support ministry WITH millennials, rather than ministry to millennials. Start by joining millennials in the places they transform, while resisting the urge to convince them to “come to church”. 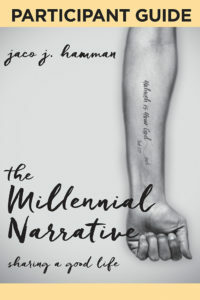 Jaco Hamman’s book “The Millennial Narrative” and participant guide will be available in October 2018. – Summary notes on the talk by Jaco Hamman done by Anriëtte de Ridder.